Enter your details below and choose your preferred UNLIMITED Trial period! 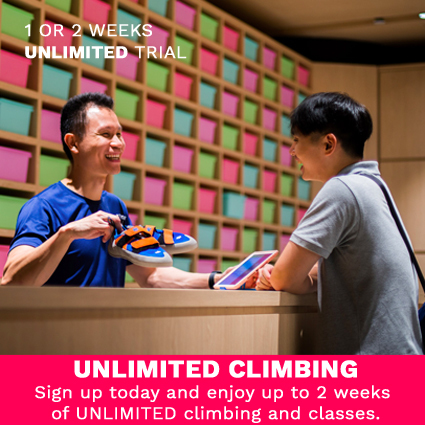 *Trial period starts from your first visit/class booking and each person is eligible for 1 Trial purchase only. *ULT expiration date: 3 months from date of purchase. If ULT is expired, can be extended subject to management approval and payment of admin fee of $30. *ULT users only have access to fundamental-level classes. Your payment will be processed using a secure 128-bit SSL encryption system. I'm excited to try out rock climbing, which I've never done before, but I heard that it's fun! I've been rock climbing for a while now but I'm looking for a convenient location that allows me to climb more frequently! That's it! Click the 'submit' button below and you're all set. Do also remember to check your inbox for the confirmation email.